Historians and archaeologists differ as to when the Mi'kmaq first came to Newfoundland. 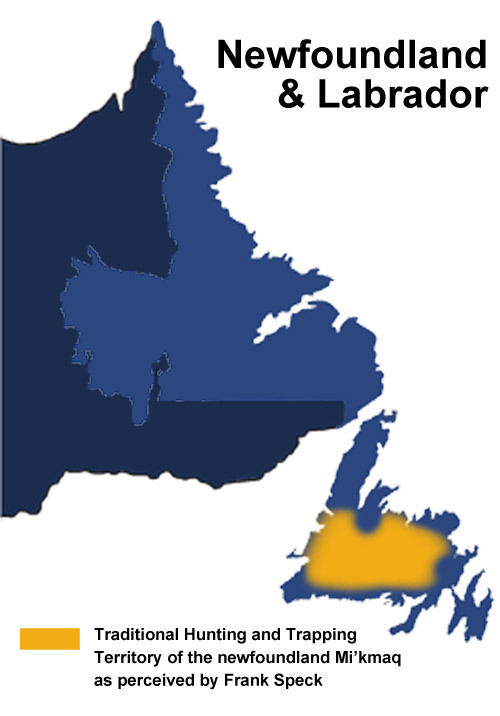 Newfoundland Mi'kmaq oral tradition holds that the Mi'kmaq were living in Newfoundland prior to European contact. There is some historical evidence that the Mi'kmaq were living in Newfoundland by the 16th century, and by the 17th century there are increasing references to the Mi'kmaq in the historical record. From Frank Speck, Beothuk and Micmac, Indian Notes and Monographs series, vol. 22 (New York: Museum of the American Indian, Heye Foundation, 1922). End Map. Illustration by Tina Riche. During the 16th and 17th centuries the Mi'kmaq had created what one historian calls a "Domain of Islands" in the Gulf of St. Lawrence. Mi'kmaq traders who had adopted the small European sailing boat, the shallop (or chaloupe), had constructed a network of exchange which ranged from the Strait of Belle Isle between Newfoundland and Labrador to the coasts of Massachusetts. These Mi'kmaq acted as middlemen in the exchange of European goods for furs. During the colonial period, the Mi'kmaq were allied with the French. As a result, when the French were defeated by the British in 1763, the Mi'kmaq in Newfoundland were regarded with suspicion by British authorities. By this time, the Newfoundland Mi'kmaq had developed a distinctive way of life hunting caribou, trapping furs, and exchanging them for necessities such as guns, kettles, knives. In the 19th century, the Newfoundland Mi'kmaq often acted as guides; for example, the explorer William Cormack, was guided by Mi'kmaq in his attempt to locate the Beothuk in the interior of Newfoundland in 1822 and in 1829. Throughout the 19th century, the 150 or so Mi'kmaq people in Newfoundland made their living as guides, trappers, mail carriers, and as sellers of basketry. Courtesy of The Rooms Provincial Archives Division (VA 13-19). Life became much more difficult for the Newfoundland Mi'kmaq with the completion of the trans-island railway in 1898. The railway brought a flood of caribou hunters to the interior of the island, and by 1930 the caribou had been hunted almost to extinction. The world-wide decline in fur prices coupled with the Depression of the 1930s spelled the beginning of the end of the old way of life. By 1945 there were no full-time trappers left in Conne River (Miawpukek), the largest Mi'kmaq community, and seasonal logging for low wages represented one of the few sources of cash for the community. Hunting, fishing, and gathering berries remained a necessary part of most families' lives. Despite their early conversion to Catholicism, many Mi'kmaq retained their traditional beliefs. Although use of the Mi'kmaq language declined drastically in the 20th century, in recent years the Conne River community has worked valiantly to revive it. In 1972 the people of Conne River formed an elected band council, and in 1973 the Federation of Newfoundland Indians was formed to work toward Federal recognition of Newfoundland's Mi'kmaq. In 1984 the Federal Government recognized the Conne River Mi'kmaq as status Indians under the Indian Act, and in 1987 Conne River was recognized as a status Indian Reserve. 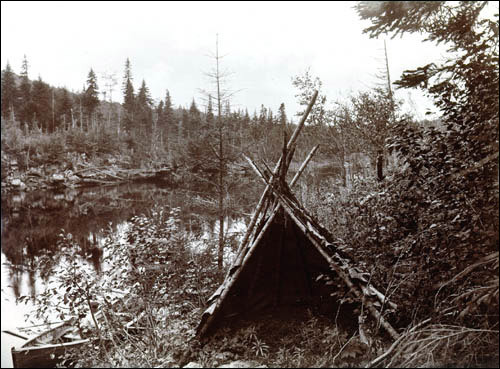 Although the Conne River Mi'kmaq have yet to have their land claims accepted by the federal or provincial government, the community has become a model of aboriginal enterprise, including, among others, a flourishing aquaculture programme, hunting and fishing lodges, and a logging operation. In an effort to promote and sustain Mi'kmaq culture, the Miawpukek Band Council sponsors a variety of cultural events and programmes, many of which can be seen on the Miawpukek Web Site. For other Mi'kmaq related articles view the Aboriginal Peoples Table of Contents.